Once again, running late with a few of these, but am catching up! My family and the kids ran away camping last week so we haven’t been in to visit Matthew. We have spent our time talking, laughing, eating ice creams, and catching up in our caravan. We have met up with Kate and her clan and it has been lovely. All the while we have been checking out how we can bring Matthew and his family along camping with us next time. Funny how you look at things differently. I have had the chance to catch up with Matthew and Di on the phone a few times and back at the rehab centre in Brisbane, school holidays have commenced. As a result, the rotating sleepovers have continued and the kids have had a chance to spend some time in the gym with Matthew. On Thursday of last week, Matthews rehab team had a big consult via skype with Sydney which was a great event for Matthew, Diane, Roy and the team. A pathway was drawn up for the next steps towards prosthetics…. so it will be a look and see process next week to determine if Brisbane is the place to proceed for now or whether Sydney will be the place to visit. All seemed pretty upbeat about this meeting. 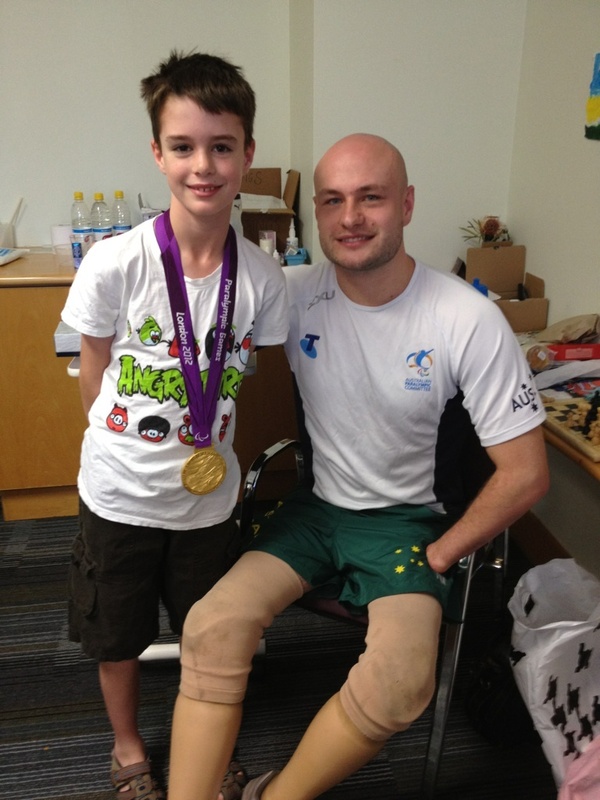 Friday brought another big event when members of the Australian Paralympic team came to visit. 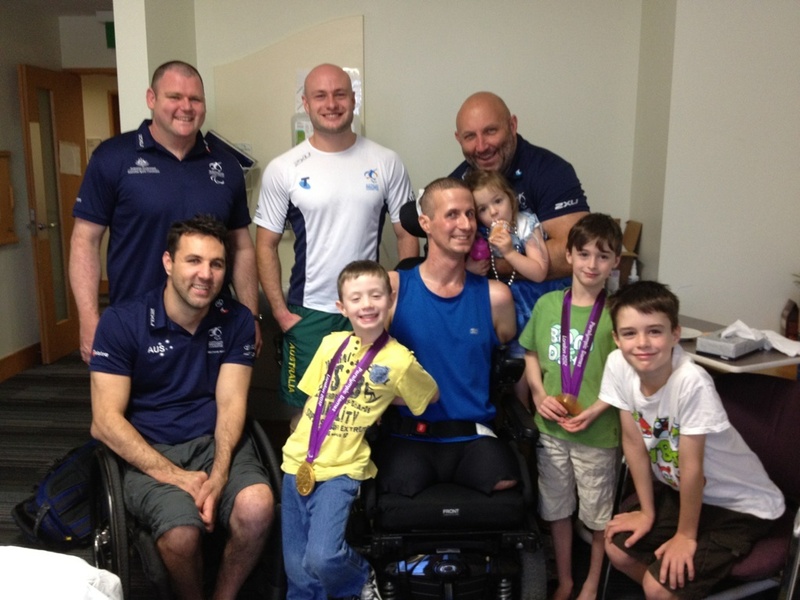 Cameron Carr and Chris Bond from the Wheelchair Rugby team brought in their gold medals. Ben and Will are wearing the gold medals in the attached photo. Powerlifters David Williams and Scott Upston also came and, according to Di, all were very entertaining and inspirational and the experience was awesome. Matthew also appreciated their advice on many things including stump care! Their strength and conditioning coach invited Matthew to come down to YMCA Bowen Hills where he can help with a training plan etc and he can join in the tryout days for different sports. Totally uplifting and positive experience. Thank you to Kim who made it happen. Matthew then spent some time in the gym and on the phone was pretty pumped to tell me about how he had played soccer with Ben! He had also had a go on a skateboard, in his usual humour noted that his arms and legs were too short to help him move and Ben was awesome propelling him around the gym! Matthews determination to gain independence continues, although he maintains a very practical approach to things. He is very aware of ‘bio mechanical limitations’ and remains creatively engaged in overcoming these with technology or mechanical alternatives….something Dad has been enjoying as well. As the weekend rolled around, Di and the kids moved in to Hotel Diana across the road. Some of you may not know that a big US trip to Disneyland had been planned for these holidays and had been years in the planning. Hotel Diana is the alternative this year with the kids very excited to be so close to Daddy. Disneyland can wait until next year. Well, nothing has stopped Matthew over the weekend. He has been staying overnight at the hotel. He returns to rehab each morning for a shower and change and heads back out again. He has been to Riverfire, dinner at the Morrison with Aunt Ruth and the family and trips to Southbank. All with some complexity to which he is completely accepting! All in all, it has been an awesome week for the family. Last night Matthew mentioned how much more comfortable the kids are with him physically, jumping and hugging with no hesitation. He is delighted. Before I end, I would like to respond to Di’s email. Thanks Di. It is just what family just does. More for the fact that the “ripple effect” has meant that our family has been able to come together – we are ever grateful. Gratitude is an overwhelming emotion in our lives these days and makes for greater experiences in the smallest of moments.To friends of mine and ours who have been shoulders, carers, drinkers and takeaway providers, thank you. You have been part of this as well. The colleagues of mine and others who have taken on extra to allow us to do all this, we simply can’t repay other than to take you along this continued journey. And what an interesting one it is becoming….